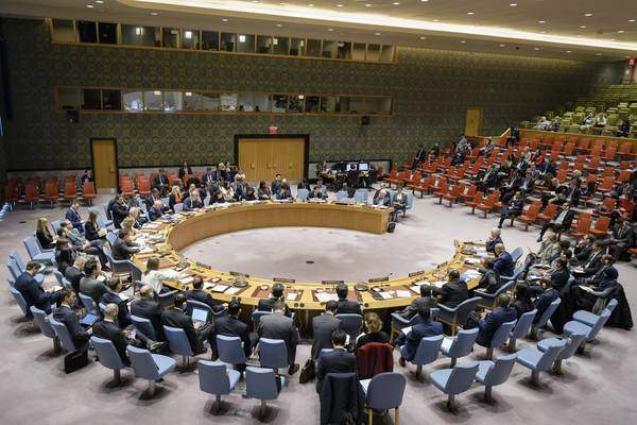 UNITED NATIONS (UrduPoint News / Sputnik - 16th April, 2019) A draft of a United Nations Security Council resolution sponsored by the United Kingdom calls for an immediate ceasefire in Libya, the document obtained by Sputnik revealed on Tuesday. The resolution "demands that all parties in Libya immediately de-escalate the situation, commit to a ceasefire and engage with the United Nations to ensure a full and comprehensive cessation of hostilities throughout Libya," the text of the draft said. The resolution calls on the conflicting sides to support UN Special Envoy for Libya and Head of the UN Stabilization Mission in the middle Eastern country (UNSMIL) Ghassan Salame's efforts toward achieving a political solution in the ongoing crisis and provide unhindered humanitarian access in war zones. All outside actors in the conflict should use their influence on Libya's parties to ensure their compliance with the relevant draft resolution. Libya has been suffering from unrest since 2011, when its long-time leader Muammar Gaddafi was overthrown and killed. Since then the country has been divided between two rival governments, with an elected parliament governing the country's east and the UN- and EU-backed Government of National Accord (GNA) ruling the west from Tripoli. The situation escalated on April 4, when the Libyan National Army (LNA) led by Field Marshal Khalifa Haftar and backed by the eastern government, announced an offensive against Tripoli in a bid to oust what Haftar called terrorist forces from the capital city. In response, armed forces loyal to the GNA started a military operation against the LNA.